Make things move, jump, and fly around anywhere in the room! There's no clue to the mystery because Black Box is hidden away from the action! This is a video tutorial for owners of the Mid-Air Card Stab. John will show you exactly how to perform this incredible effect. Every detail is clearly shown, allowing you to learn this illusion in the most efficient possible way. This standard CD ROM will play on your PC or MAC computer. 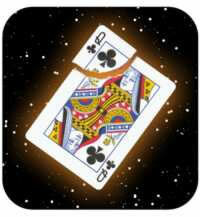 Imagine this: A card is freely chosen from an ordinary deck. You tear off a corner and hand it to a spectator as a receipt. The rest of the card is replaced in the deck and inserted back into the box. 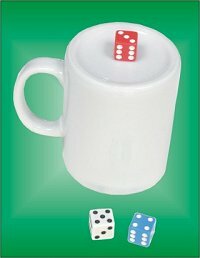 A spectator shakes three colored dice inside a coffee cup, then peeks inside and announces the total. 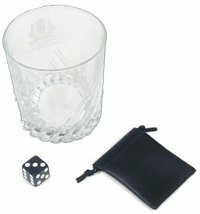 Next he memorizes the number on one of the dice, then inverts the cup on the table with the dice underneath. Up until now no one else has seen the dice. 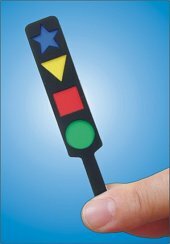 1) Make any chosen shape instantly change color on the paddle. It looks amazing. 2) Change another chosen shape to a spectator's chosen color. It's beginning to get a little bizarre. 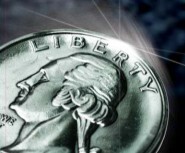 Extra SUPERCOIN is exactly what it says - an extra coin! It costs less because there is no DVD included. It's the best choice if you already have SUPERCOIN DVD 1 and just want another coin or a different denomination coin. Choose the coin you want from the drop-down list. Extra charges are shown for some coins in the list. 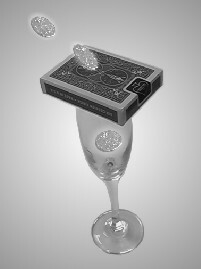 With Flight Deck you can cover any cup or glass with a deck of cards, then make coins magically appear inside. Repeat it as often as you like. 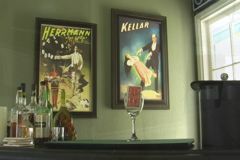 You can even let a spectator hold the glass when the coin appears! Borrow a dollar bill as you bring out a pen. Fold the bill and rub it against the pen "to generate a static charge." 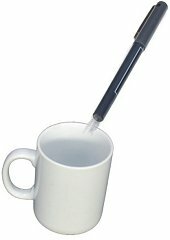 Suddenly the bill floats above the pen, hovers a moment, then floats back down and lands on the pen! 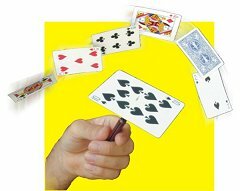 Six cards are removed from any deck, then a spectator freely selects one. You shuffle them and lay them down in a row. "Perhaps you're wondering why I'm using only six cards," you say. Make silks, dollar bills, etc. fly 20 feet through the air and into your hand with this miniature electronic reel! 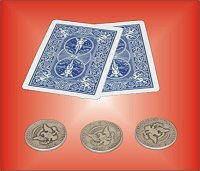 Make three coins travel mysteriously one at a time underneath two playing cards. Each translocation becomes more impossible as you slowly show your hands empty before and after the coin travels. You really must see this to believe it! Make things jump with this incredible hidden device. You will make pens jump out of cups, napkins jump off tables, even candy jump out of its bowl! Meticulously redesigned and perfected, Jump will allow you to perform miracles that simply cannot be done any other way! The instructions will teach you everything you see on the video demonstration and more! You're always ready to perform. No reset is needed.